Come visit the winding roads of the Ozark Mountains. These roads lead to many of Arkansas' most fascinating communities and places. People travel to the Ozark Mountains to explore the Buffalo River, see historic sites, and enjoy nature, beautiful scenery, and pristine lakes. Folk life throughout these mountains creates a unique culture, chiseled from years of tradition. Outdoor adventure is waiting to be found in this warm and welcoming region. Ozark Byways is a regional revitalization project of Rural Community Alliance in partnership with its member communities in north central Arkansas. 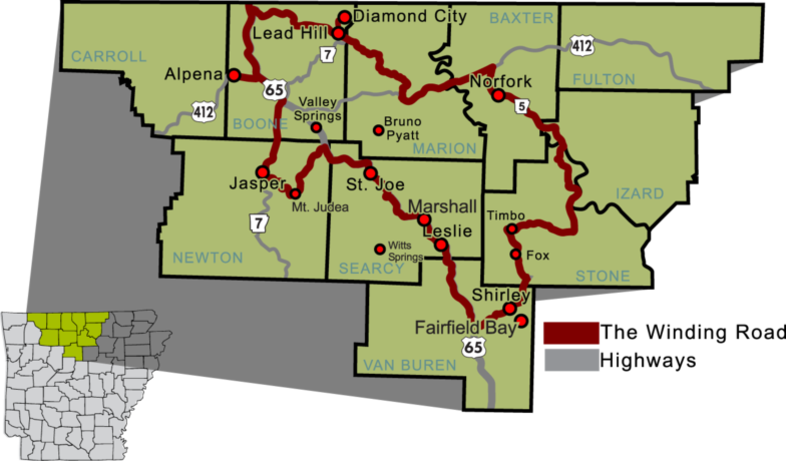 Its purpose is to provide information about rural Ozarks communities to the discerning traveler or to the person or business looking to relocate in a safe and caring small-town setting. Ozark Byways enhances revitalization efforts being carried out in local communities. Rural Community Alliance is a non-profit organization whose purpose is "helping rural schools and communities survive and thrive."